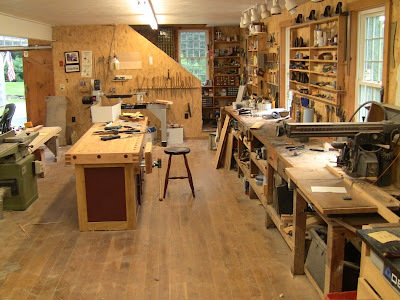 Ray Duffy's three-level barn-style workshop. One of the fun things about this hobby is that people love to share it. They're generous with their time and their knowledge. 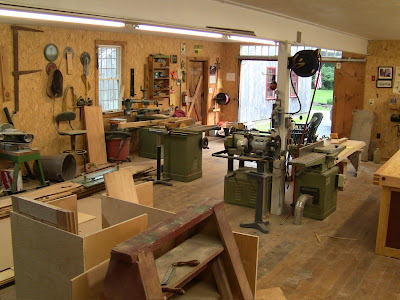 I've gotten several invitations to visit workshops from woodworkers in the area. Ray Duffy, a retired IBM software engineer, is one. Ray is living the woodworker's dream. 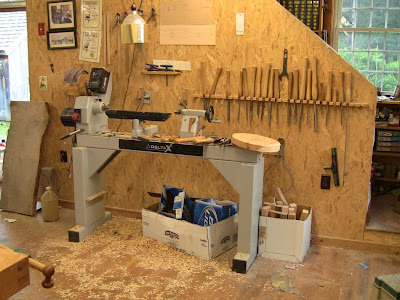 While I choose to use hand tools, it's fun to see what someone can do when they can afford good power tools and the space for them. 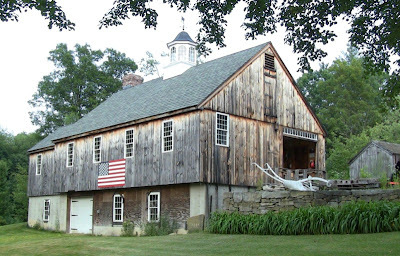 He's graduated from a basement workshop, to a good size shed, to the magnificent barn pictured above. The main floor is the primary workshop space, well insulated and heated with a wood stove. 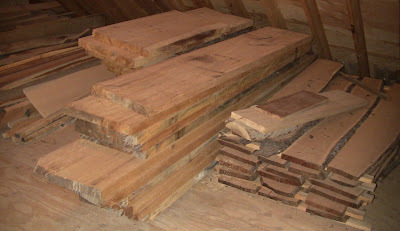 Upstairs in the attic space is the lumber drying area. 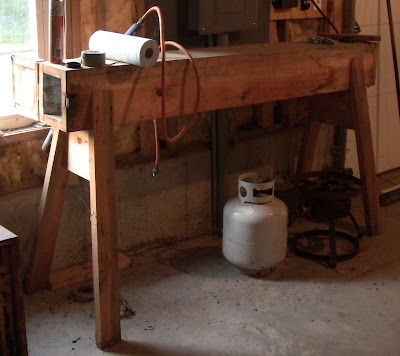 Down in the walk-out basement is dust collection, steam-bending, and forge. Yes, he does his own blacksmithing! He also has another shed for his end-loader and additional drying space. Ray has eight acres of heavily wooded central Massachusetts property, now shared with houses for his son and daughter. Not only does that make for a beautiful setting, it also provides him with a private stock of timber. Ray loves to make chairs. He's also an accomplished turner. That timber, and local selective logging, keeps him fully stocked. And these are good size trees, in a variety of species. No glued-up chair seats for him, they're all solid pieces, cut from massive pine slabs. A neighbor rough mills the logs for him. It's like he has his own personal lumber yard. He works with a mix of power and hand tools. Chairs are like boats, he said. No straight lines, all curves. He's taken a couple of Mike Dunbar's classes and knows Peter Galbert. He apologized for being a little messy. Hey, this is a workshop, no need to apologize, because there's definitely a lot of work going on. In addition to several chairs, he's currently building kitchen cabinets for his son's house. On my first visit this past Sunday, he showed me several chairs and gave me a demonstration of turning a "bamboo" pattern leg. He also showed me a Galbert caliper in action; quite a nifty device! Then he gave me a maple blank and cut up a big slab of cherry for more, so I can turn the rest of the legs and stretchers for a stool. When those are ready I'll go back and we'll make the seat and "leg-up" the stool. I ran out of time Sunday because I had to get my daughter to a birthday party, so I went back Tuesday evening to get pictures and see the basement level. He also showed me the "firewood pile", full-length logs. 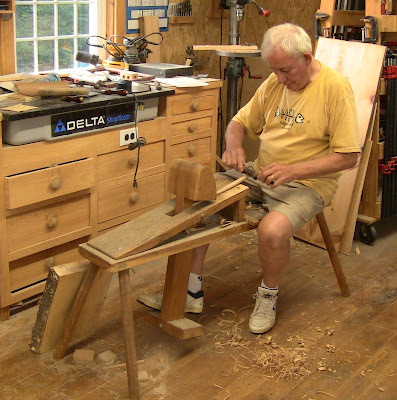 Ray at his shaving horse, working on a chair spindle with a spokeshave. For his retirement, he does the work of ten men. The landscaping and vegetable gardens are just as nice as the shop. The view from the entrance. The wood stove in back provides heat in winter. He's had the Grizzly power tools for 20 years. The view back to the entrance. This is a very spacious shop, rivaling many professional operations. The bench area. Hand tools are on the wall shelves. 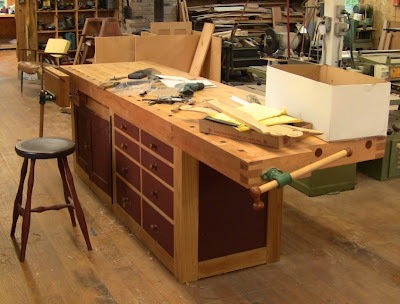 The bench Ray built, and one of his stools. 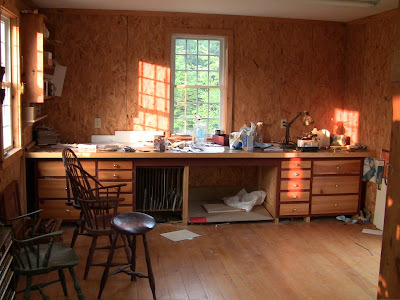 The drawing and finishing room in back, out of the sawdust, with the setting sun streaming through the windows. 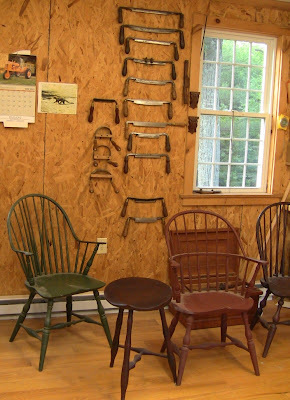 Some of Ray's chairs, including a three-legged Galbert Perch. He made several of the drawknives and inshaves in his forge. The photo on the wall is a fisher cat he saw robbing eggs from a mallard's nest. Upstairs in the drying loft. Look at the size of those slabs! There are a lot of chair seats in those stacks on the left. The stacks on the right are cherry logs from the firewood pile. He stacks and stickers for a year, then stacks flat. That's some work, hauling those big boards up and down the stairs and around the loft. 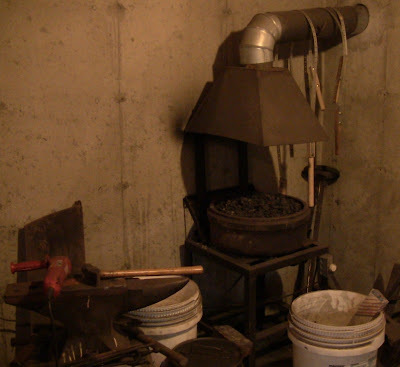 The forge in the basement. It's piped to one of the chimney flues. Those are bending straps hanging on the pipe, for use in making chair backs. The steam box. It slopes down a bit for condensation runoff. A radiator hose comes through the shop wall and into the back of the box. He runs the burner outside and sticks the spout of a big water can into the end of the radiator hose. 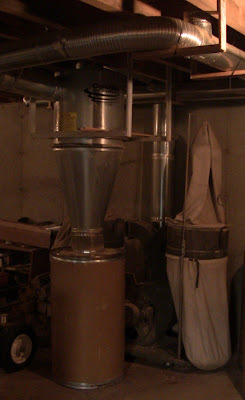 The dust collection system, controlled by radio keyfobs hung near the power tools. 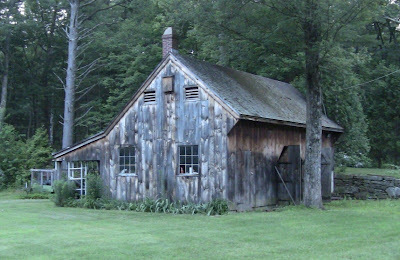 The old workshop. What a gorgeous place! The tree frogs and birds were singing as the sun set. About that magic. Remember I said Ray demonstrated turning a leg and gave me some blanks to do my own? Sunday afternoon after dropping my daughter off, I went down to the basement to check the bed length of my JET mini-lathe. The finished stool legs are 19" long. The mini-lathe can only handle 14". Some quick checking online and a couple phone calls revealed a bed extension available at the Woodcraft in Woburn, MA. I made a mad dash to get there and back in time to pick up my daughter from her party. It attached easily. This really is a smooth little lathe. Ray had shown me a few fine details. The first thing I realized was that I was being far too timid on the lathe. I tried what he had shown me, then watched a bunch of YouTube videos on lathe work. While I have several books on it, it's such a dynamic process that static pictures and diagrams really don't convey it well. Watching several different people was key, each with his own particular details and emphasis on tool handling, placement, and movement. JET videos on skew and gouge use and sharpening. Peter Galbert on skew sharpening, preparation, and use, and a practice exercise. 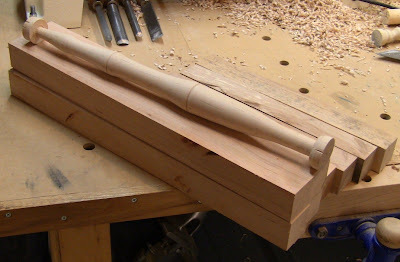 Ron Brown on roughing down with a skew, and spindle practice. I sharpened the skew chisel the way Peter Galbert showed, grinding a slight curve to the edge and honing on an oilstone. And here's where the magic happened. I tried doing what I had seen, and it just worked! Suddenly, I was able to use either roughing gouge or skew to take blanks down to cylinders quickly, use the skew to smooth them to rolling-pin uniformity, and use the gouges to carve out coves. You have to realize, up to this point my lathe work resembled the random gnawing of rodents. They were more like droppings than turnings. To suddenly achieve control like this was nothing short of magic. Ok, maybe it was a miracle. Either way, an incredible leap. What changed? 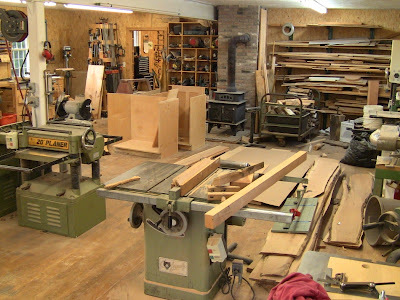 It's hard to say, but I think learning woodworking is an iterative and cumulative process. You try something a few times and it doesn't work well, so you spend your time on things you can do. Then you come back to it again, and suddenly the accumulation of skill reaches critical mass. My control of hand tools in general has improved over the last couple years, and my sharpening has really improved. So the combination of good instruction, with better overall control, with sharp tools, finally pushed me over the hump. Thanks for the kickstart, Ray! 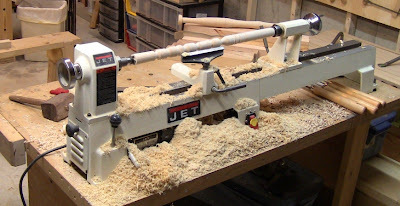 My JET mini-lathe with bed extension. That gives it 40" capacity. One of Ray's maple blanks is mounted up. It was cut from the edge of the board; after getting past the bark, it was too narrow to use for a leg, so I just used it for practice. Ray's leg for me to duplicate, and the remaining blanks. I spent 3 hours Sunday evening practicing my magically acquired skill on maple, pine, and poplar, and 2 more Monday night. It shouldn't be long before I can head back to Ray's with all the legs turned.